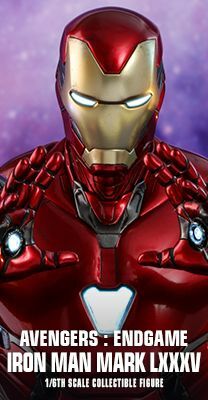 Avengers: Endgame will drawn audience to witness the turning point of this epic journey, and for the first time ever, Captain Marvel and the Earth Mightiest Heroes are teaming up to overcome an immense obstacle. 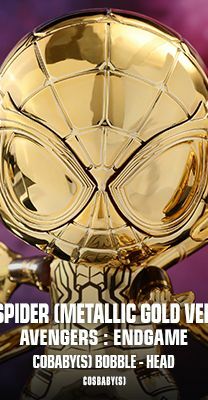 Today, Hot Toys is very excited to present the most remarkable super hero line-up based on this uplifting release! 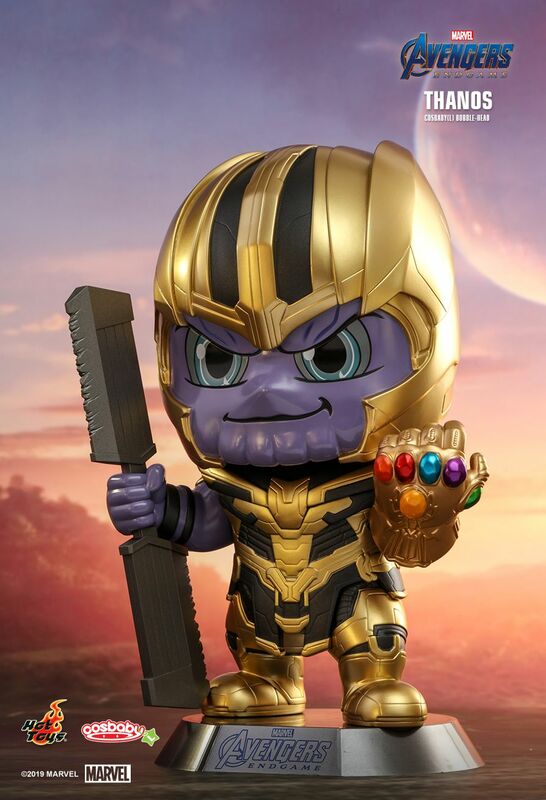 Meet the stars of Avengers: Endgame Cosbaby featuring Captain America, Iron Man, Hulk, Black Widow, War Machine, Hawkeye, Ronin, Captain Marvel, warlord Thanos and Infinity Gauntlet. 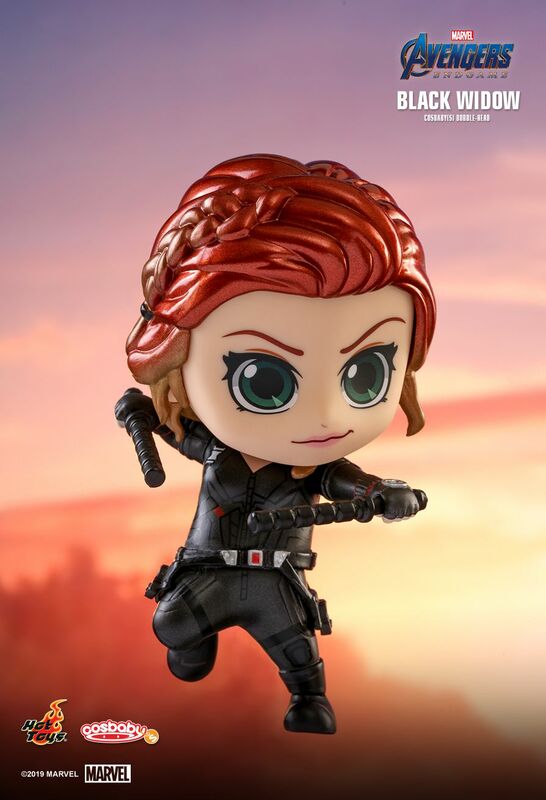 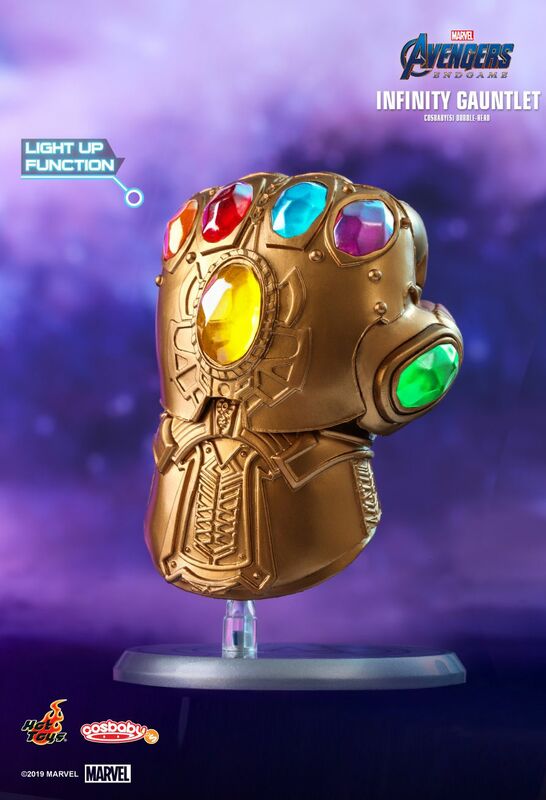 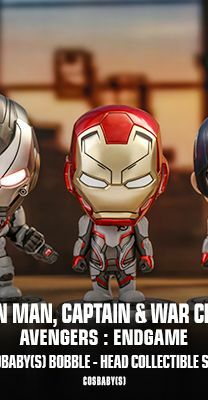 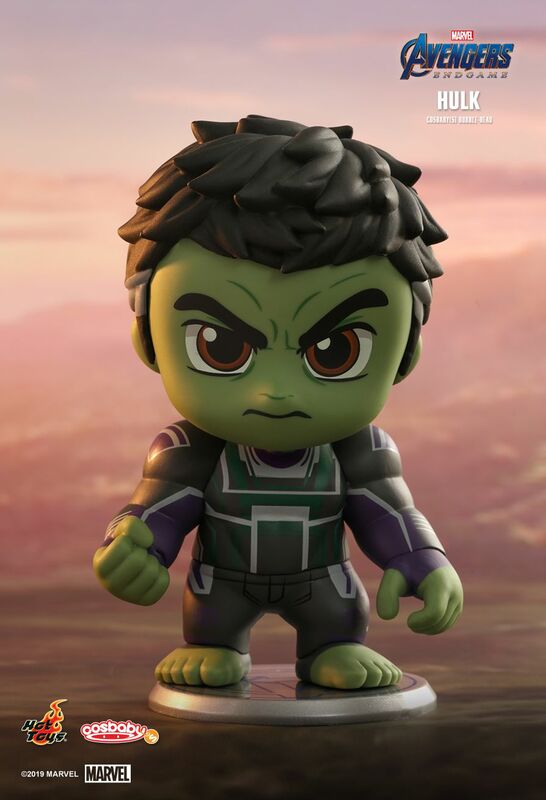 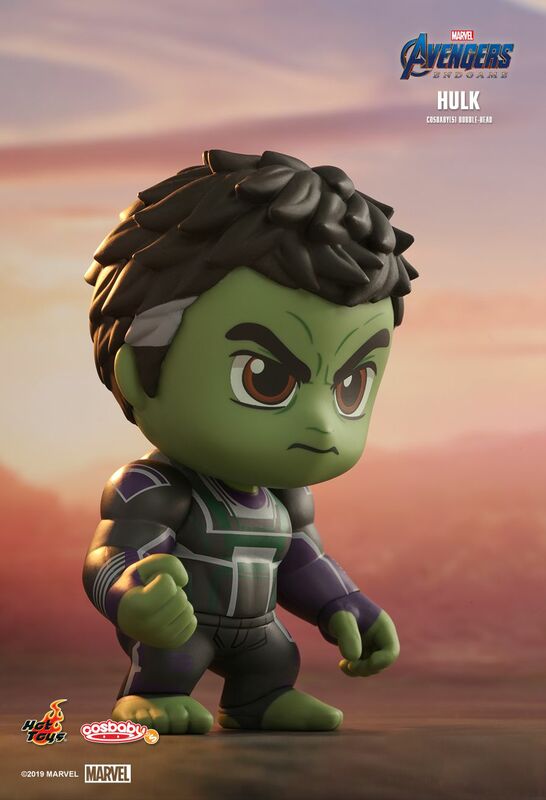 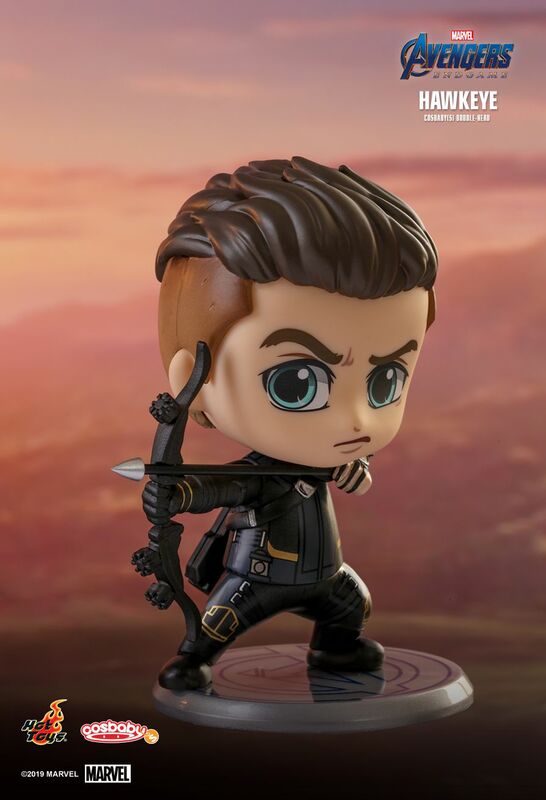 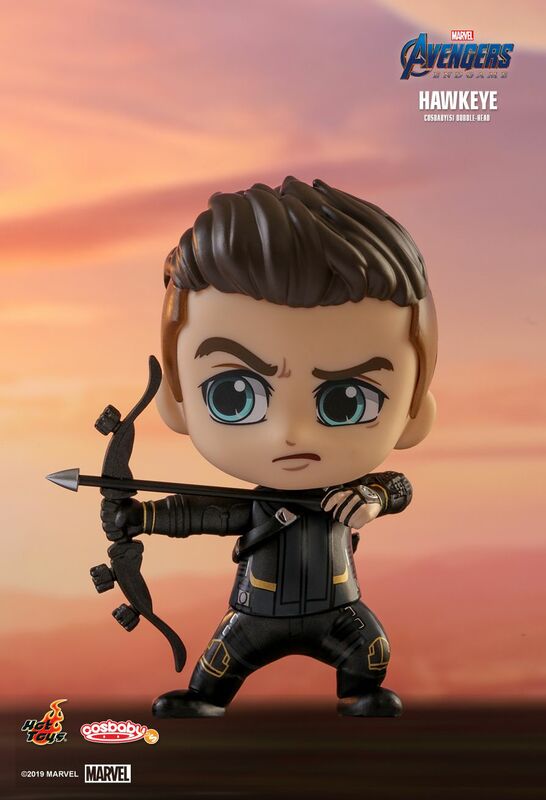 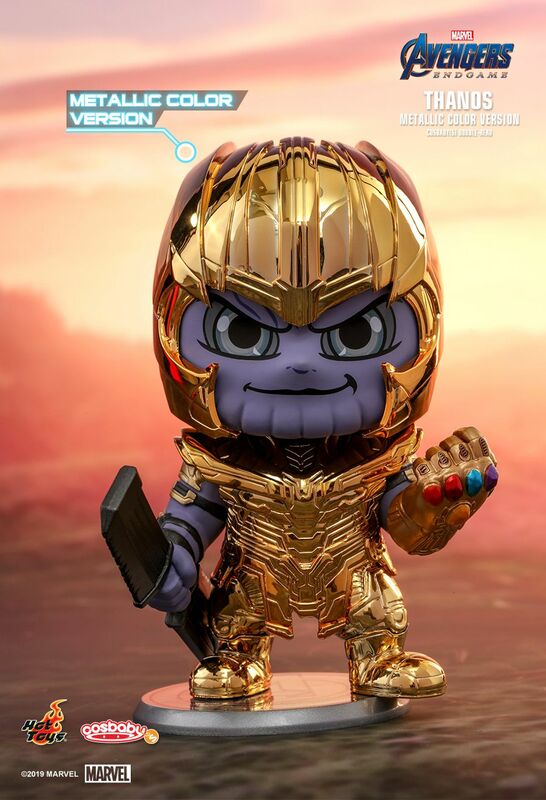 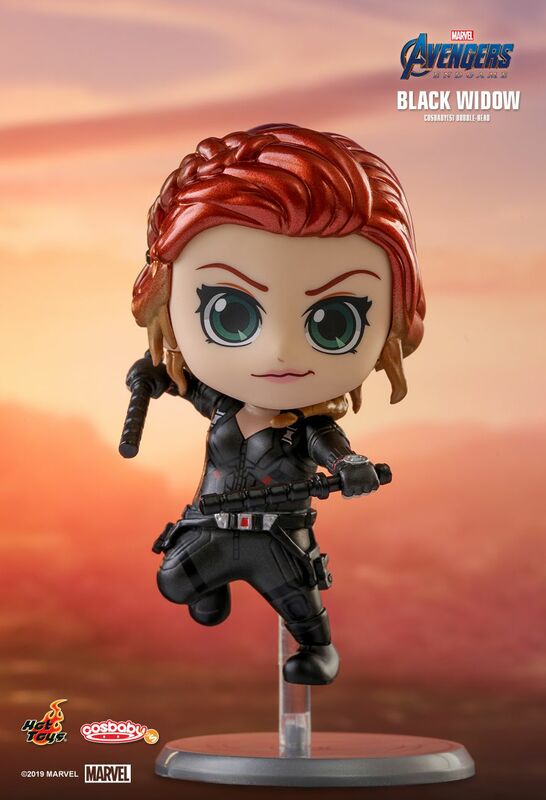 Each Avengers: Endgame Cosbaby (S) Bobble-Head measures about 9 -12cm tall and comes with bobble-head function! 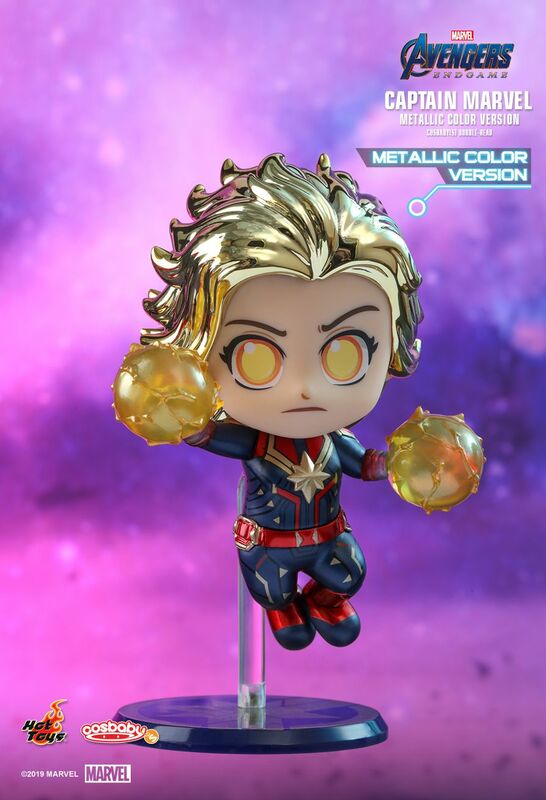 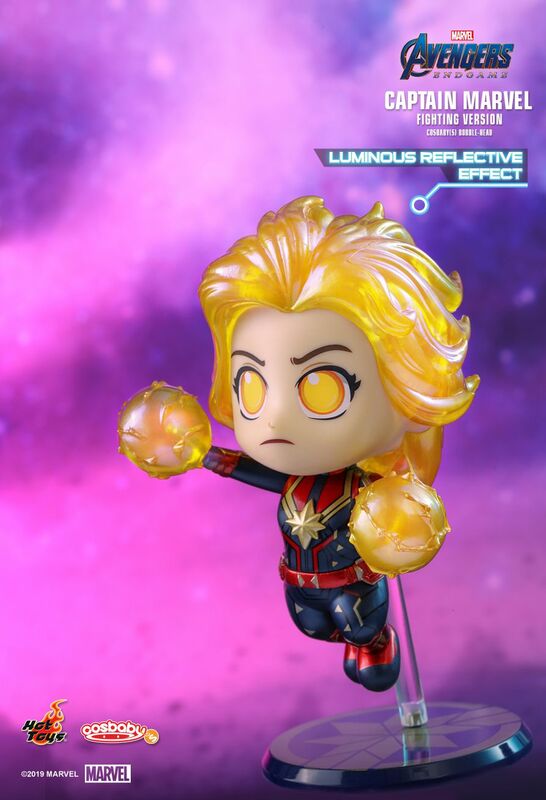 Captain Marvel Cosbaby presents the cosmic-powered hero in her classic battle suit with luminous reflective effect on eyes, hair and hands. 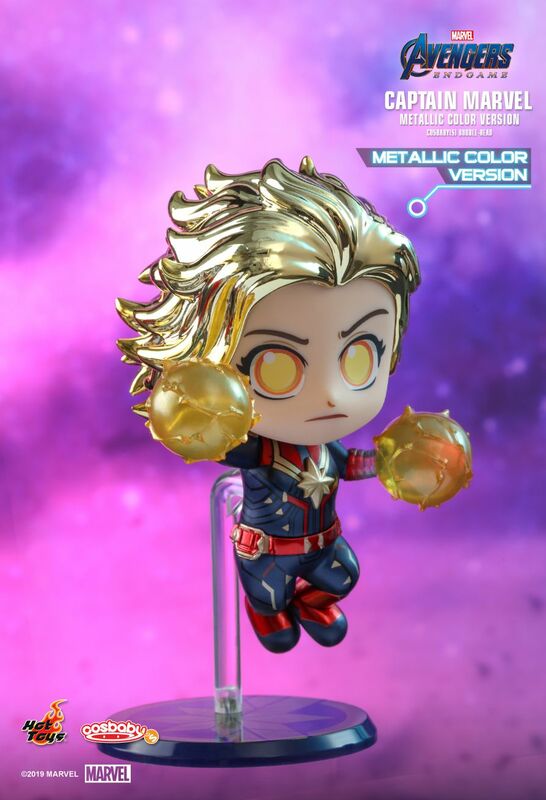 A Metallic Color Version features her hair in shiny gold chrome color is specially designed for sophisticated collectors. 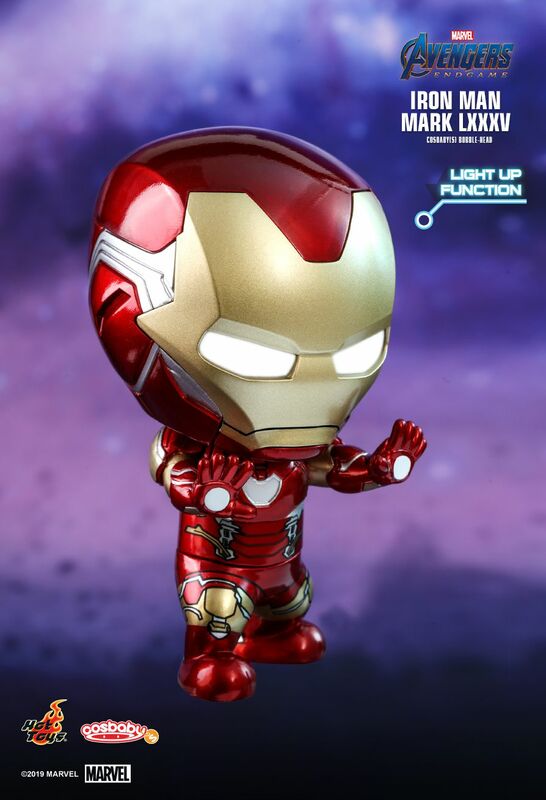 Famous in armor red and gold, Iron Man Mark LXXXV Cosbaby sets the super hero in classic Iron Man pose with his legs planted and arms held back as he prepares to unleash a devastating strike with LED light up function. 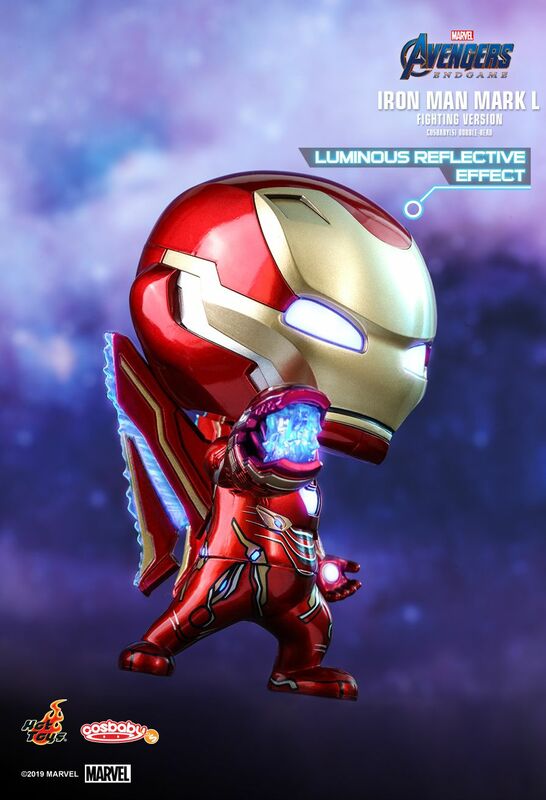 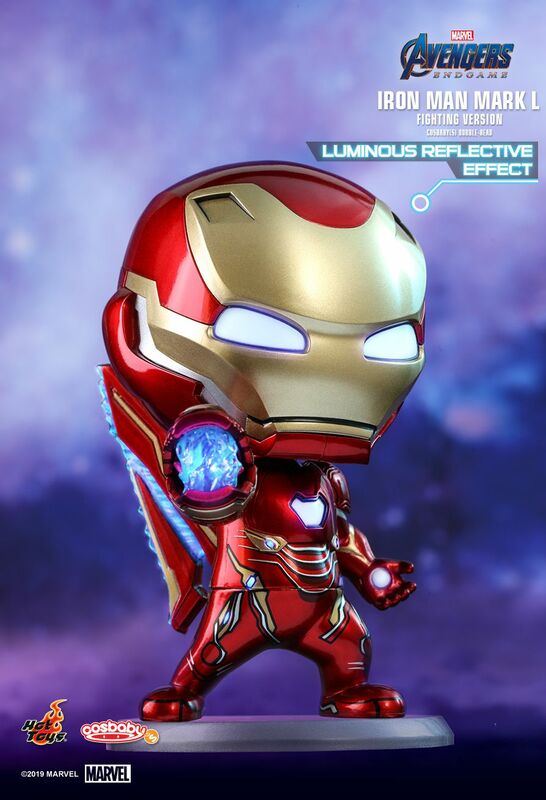 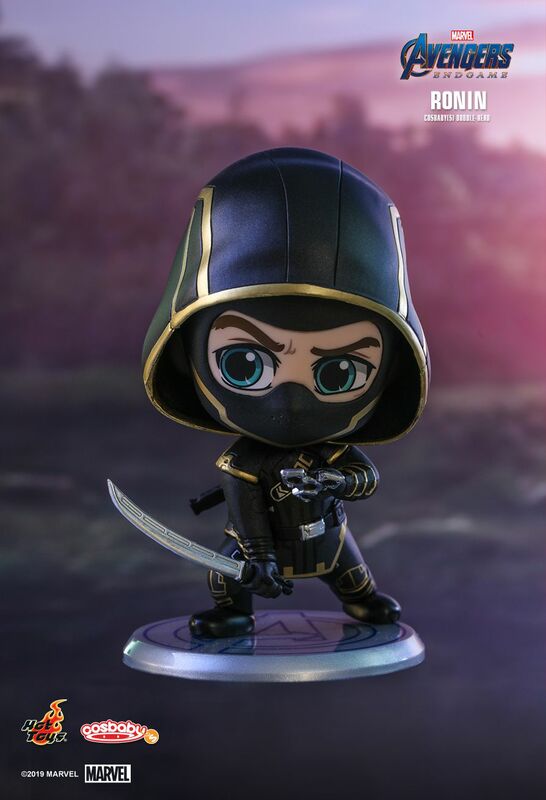 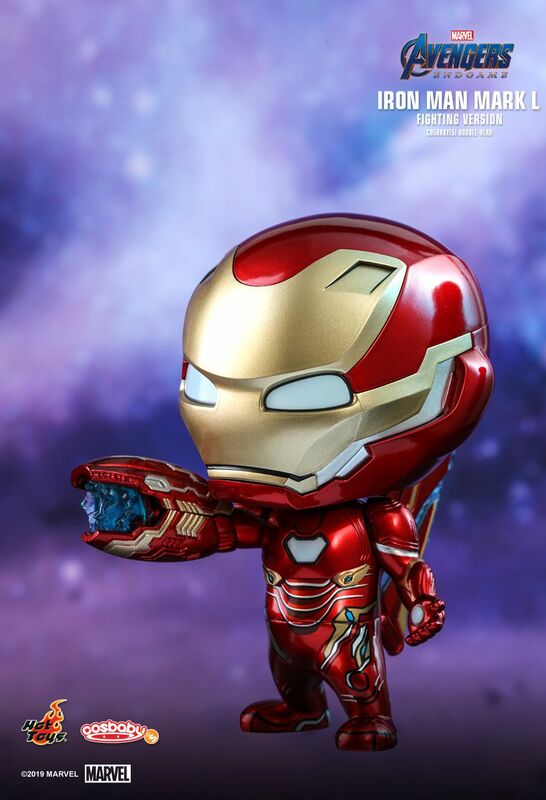 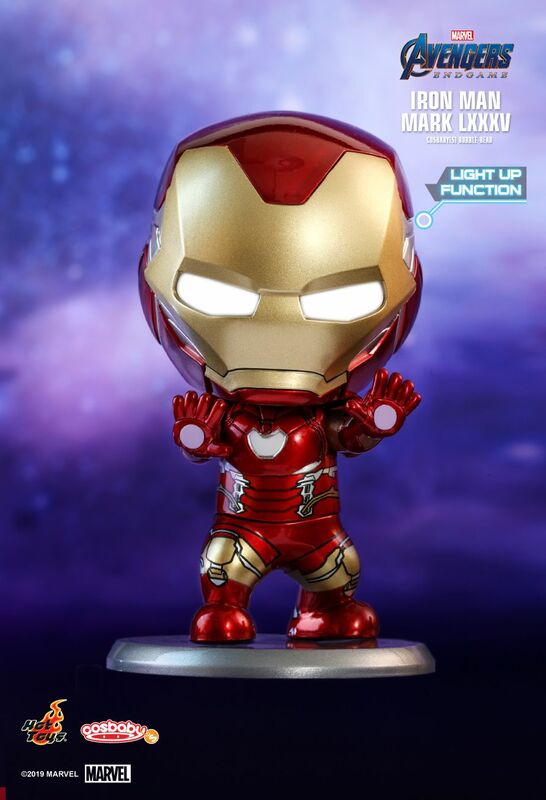 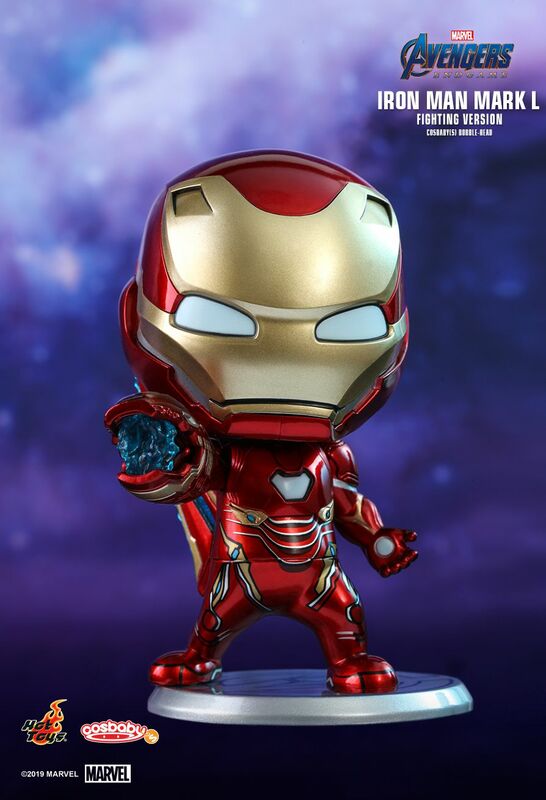 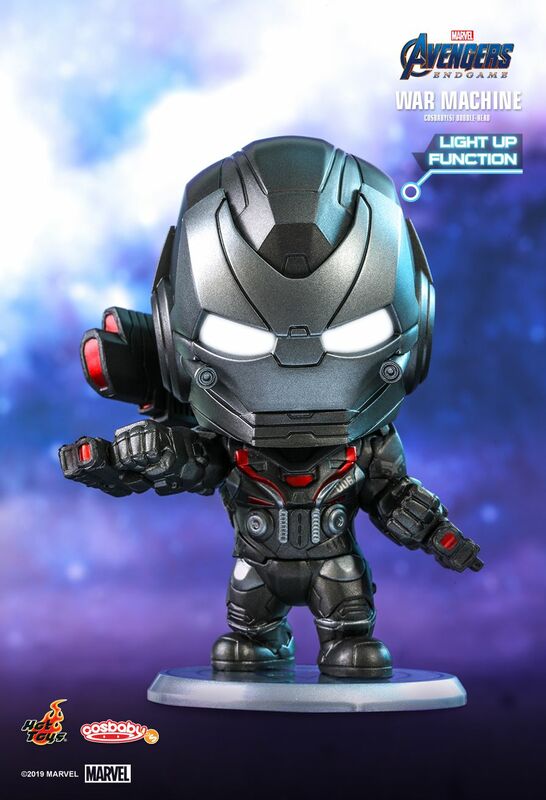 Moreover, Iron Man Mark L Cosbaby in fighting version comes with luminous reflective effect on eyes, arc-reactor, palms and weapon is a piece that fan should not miss! 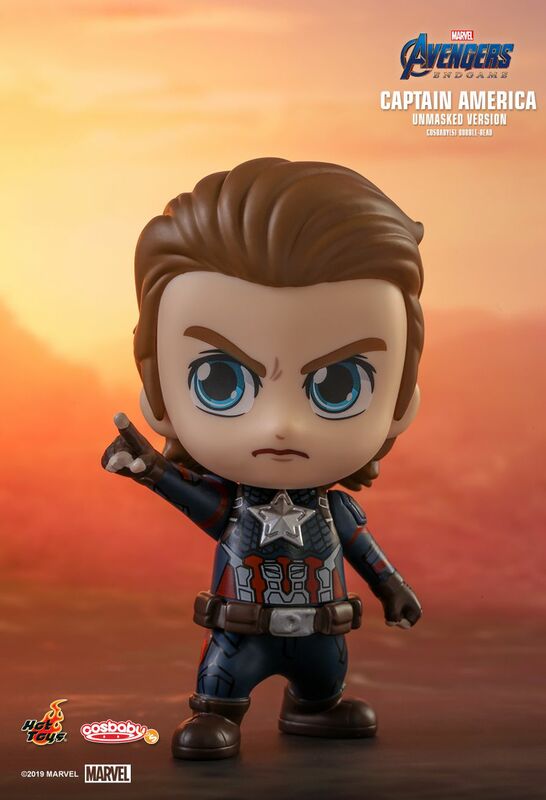 Our beloved Captain America is back! 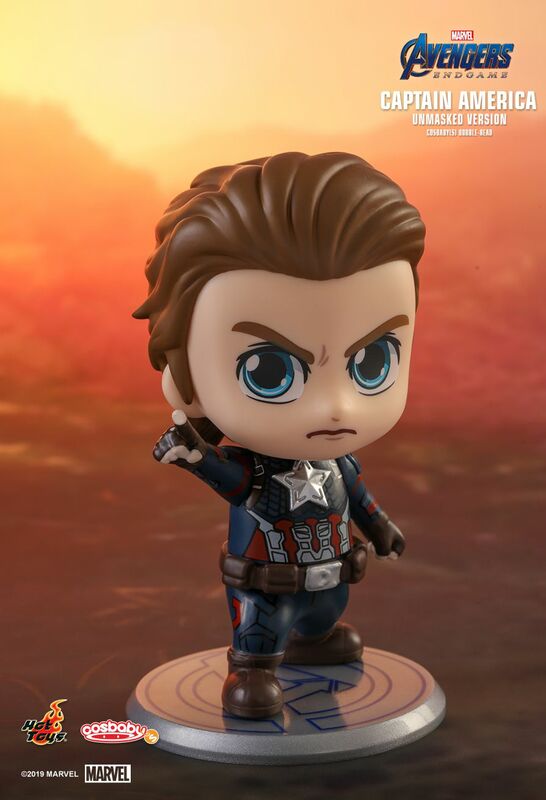 Dressed in his traditional navy blue and red uniform, the super soldier is always determine and ready to defend his country and people. 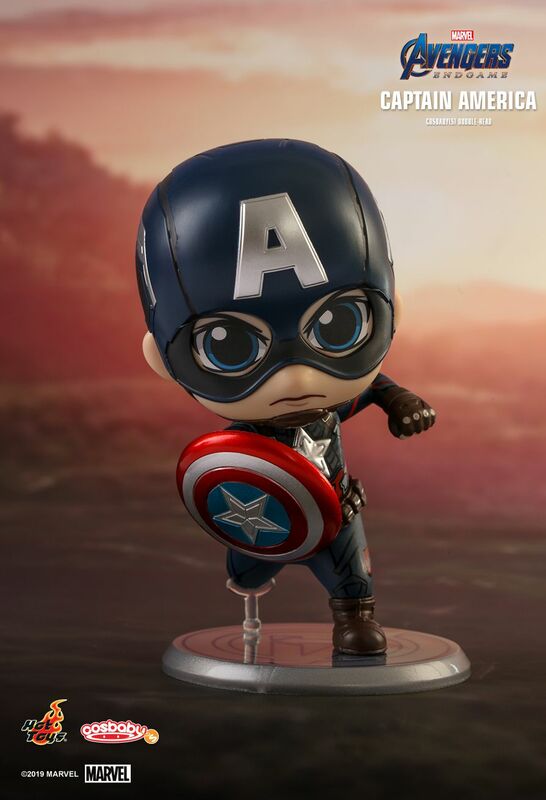 An alternative version of Captain in mask wielding his famous shield and braces for a fight is available for purchase as well. 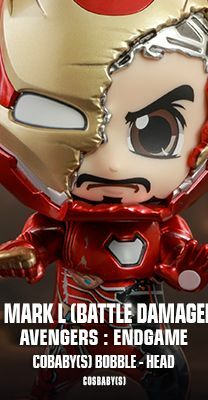 Check out the Avengers geared up in their new battle suits! 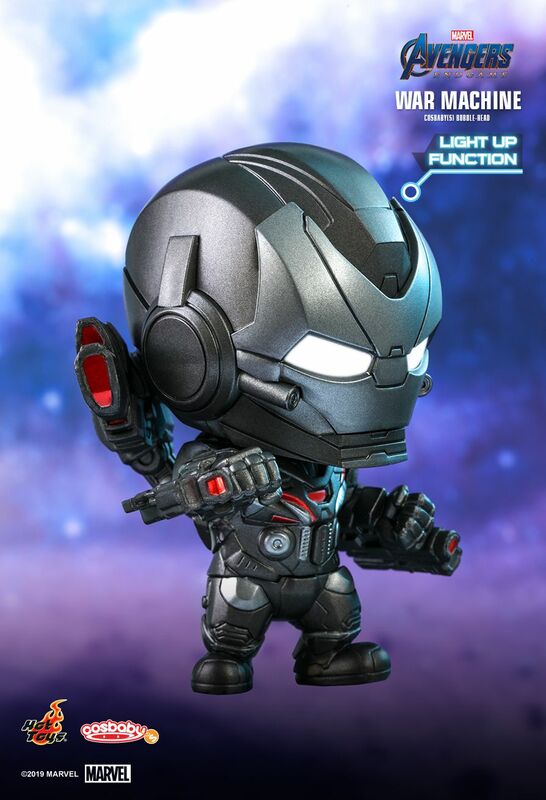 Black widow has put her batons out, Hawkeye wielding his bow and arrow, Ronin sharpening his sword, War Machine in position with his fully loaded cannon and LED light up function, Hulk ready for any fight, and the invincible Infinity Gauntlet with LED-light up stones. 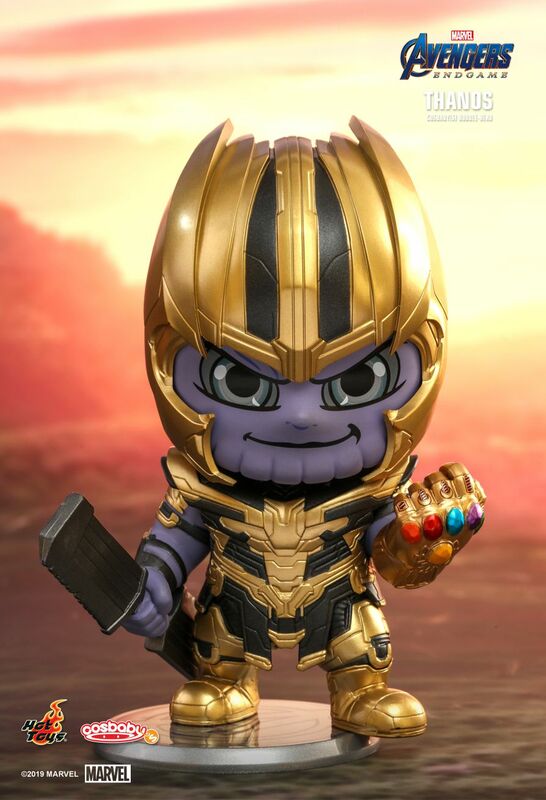 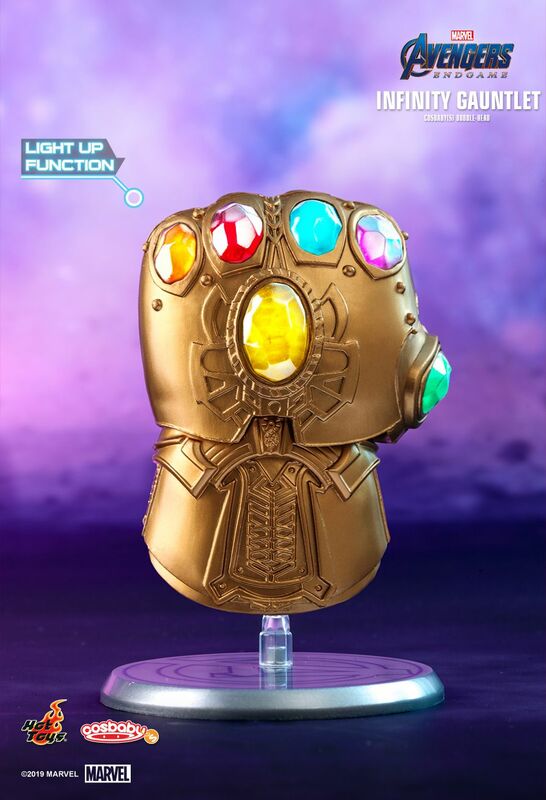 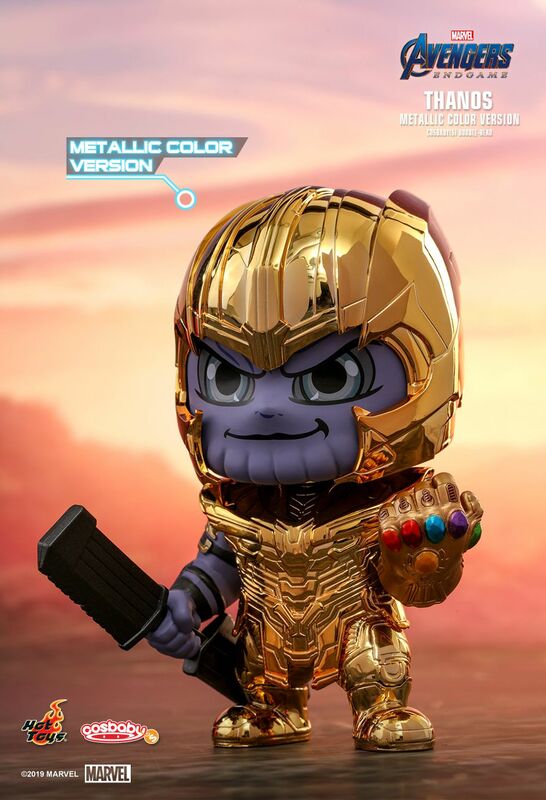 Two choices of Thanos Cosbaby are available for fans to choose from, including a shiny Metallic Color Version and a large size of Thanos Cosbaby standing at approximately 23cm tall! 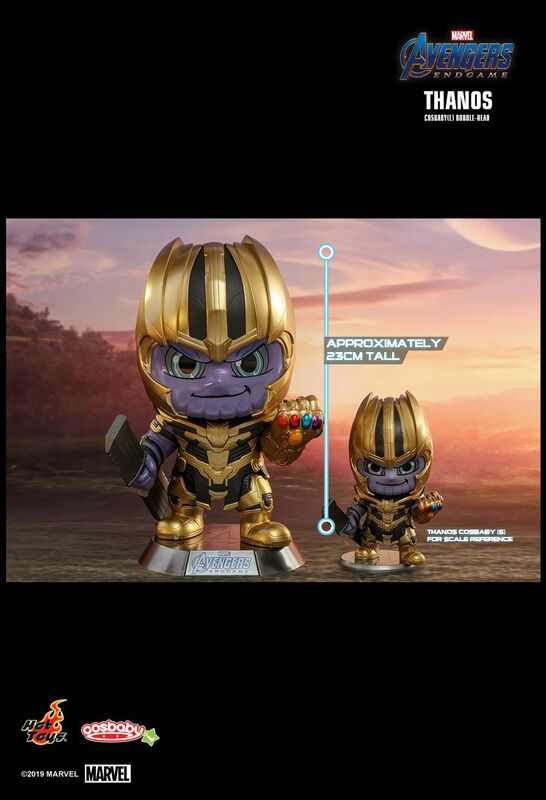 Both of these collectibles depicts the warlord with Infinity Gauntlet and his blade. 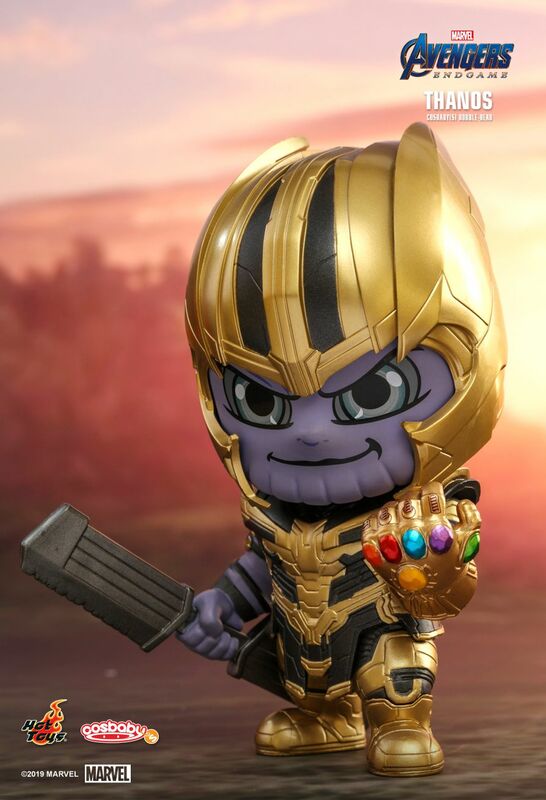 Among all of these super exciting releases, Thanos Cosbaby (S) Bobble- Head and Iron Man Mark L (Fighting Version) Cosbaby (S) Bobble-Head are only available in selected markets! 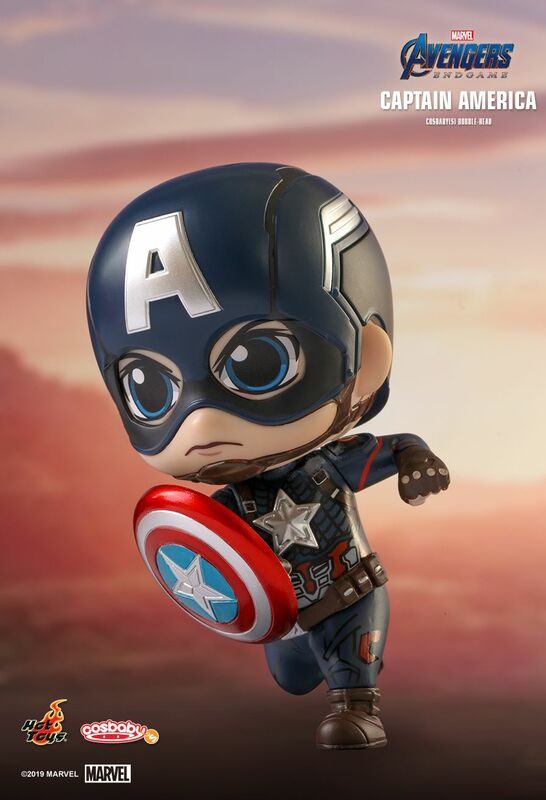 Showcase your inner superhero with this fantastic Cosbaby collection inspired by the upcoming Avengers: Endgame! 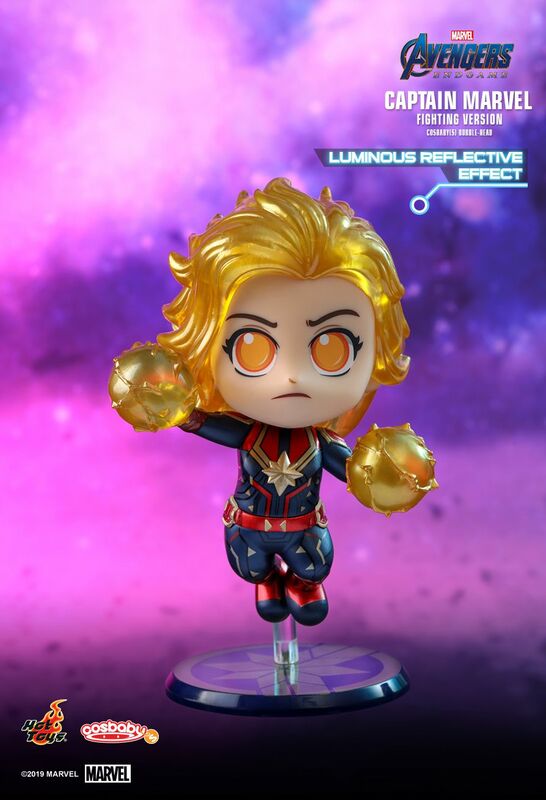 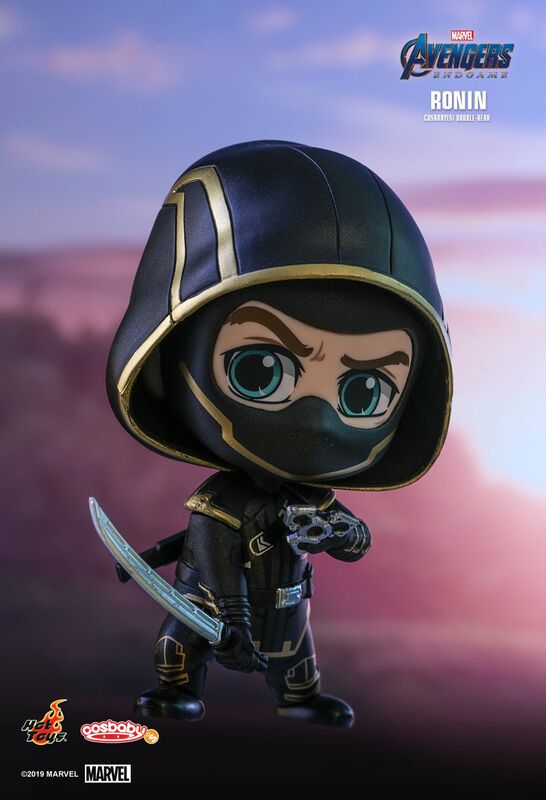 -	“Captain Marvel (Fighting Version) Cosbaby (S) Bobble-Head” contains specially applied luminous reflective effect on eyes, hair and hands.